Cocktails in frozen form! We’ve used dark rum for extra flavour, but you could just as well use white, or simply leave it out and blend an extra 50g watermelon into the mix. 1. Heat the sugar gently in a saucepan with 75ml water until dissolved, then bring to the boil and simmer for 1 minute. Set aside to cool, then stir in the lime juice. 2. In a blender, whizz the lime syrup with the watermelon until very smooth. Add the rum, to taste, but go carefully and don’t add much more than 175ml, as too much alcohol will prevent the lollies from freezing solid. 3. Divide the mixture between 8 x 150ml lollymoulds (or use paper party cups) and freeze for 1 hour; place a wooden lolly stick into the centre of each one and freeze for another 2 hours or overnight, until frozen solid. 4. To serve, run the moulds under warm water for a few seconds until easy to release (or tear away the paper cups, if using). 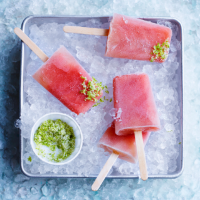 Mix the remaining 2 tbsp sugar with the lime zest and sprinkle over the popsicles before serving.